Mining large datasets using machine learning approaches often leads to models that are hard to interpret and not amenable to the generation of hypotheses that can be experimentally tested. We present Logic Optimization for Binary Input to Continuous Output' (LOBICO), a computational approach that infers small and easily interpretable logic models of binary input features that explain a continuous output variable. 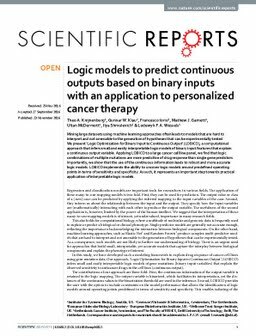 Applying LOBICO to a large cancer cell line panel, we find that logic combinations of multiple mutations are more predictive of drug response than single gene predictors. Importantly, we show that the use of the continuous information leads to robust and more accurate logic models. LOBICO implements the ability to uncover logic models around predefined operating points in terms of sensitivity and specificity. As such, it represents an important step towards practical application of interpretable logic models.